Salam & hello everyone! Last Friday evening was a hectic day. I just finished my 1st stage of my Final Year Project. Phew. Alhamdulilah it went well. Later that evening, Ieda Mansor and Charmaine invited me to watch the Mark & Spencer Fashion show help in front of KLCC which is the Esplanade. 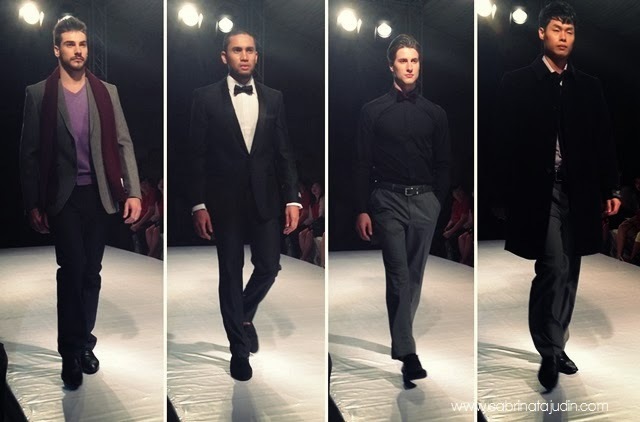 The fashion show is one of their show in the annually KL Fashion Weekend Spring/Summer 2013. I don't know why it is called Spring and Summer since its like the Autumn and Winter Season. Oh yea, we dont have Autum and Winter. Tee hee... The show is also a conjunction of the 1Malaysia Mega Sale Carnival 2013. Organise by Tradisi Busana PR with the help of Malaysia Tourism Malaysia and participating retail giants namely Metrojaya and Parkson. Now let see what they have in store for the season! The collection is most likely a Autum/Winter Collection inspire by magical fairytales. I love the collection! Lastly, the highlight of the event, I got to meet Ieda Mansor & Iena Mansor, the cute gorgeous twins, also Fatin Suhana & Farah! Below is the video for their Collection advertisement. Highlighting the magical Christmas! You lucky porcelain unicorn you! !